The heavy shore-end sections of submarine cables sometimes contain one or more extra conductors, or a second, parallel, cable may be used to provide what is known as a "sea earth" or "sea ground" for the cable station's receiving and transmitting equipment. Sea earths. As we have seen, a submarine cable constitutes a condenser of definite capacity. One plate is represented by the external surface of the copper conductor and the other by the external surface of the gutta-percha which 'is in continuous contact with the water of the sea, and therefore at earth potential. The gutta-percha represents the dielectric. It is necessary, therefore, that the outer plates of the condensers constituting the artificial cable should also be at earth potential, and that this earth should be the best it is possible to obtain and nearly equal to that of the submarine cable. When we come to examine the transmitting apparatus it will be found that it uses current from a battery of which the two poles are, one or the other, continuously to earth for each signal transmitted. When one pole is to earth the other is connected to the cable and sends a current which, having produced the desired effect on the receiving apparatus, returns via earth to the other pole of the transmitting battery. The currents used in submarine telegraphy are extremely feeble, and therefore the resistance of the battery earth must be very low. Two extremely good earths are therefore necessary. These are provided by adding at the end of the submarine cable two conductors which are insulated and contained in the cable in the same way as the conductor carrying the signals. One of these conductors is connected at the sending station to one pole of the transmitting battery ; the other is connected to the outer plate of the artificial cable. The other ends of the earth conductors are taken out of the cable and soldered to the metallic armouring at some distance out to sea. The length of the earth conductors varies. The battery earth is shorter than that of the artificial cable. The former may be as much as 5 to 6 miles long, and the latter varies from 8 to 12 miles for cables of normal type to 100 or more miles long for the most modern types of loaded cable, according to the nature of the bottom of the sea. The sea earth avoids interference and prevents stray currents, which would disturb the signals, from being picked up. Such currents are very common in the subsoil of large towns. Allan Green, Research Fellow at the Porthcurno Telegraph Museum in Cornwall, sends these photographs taken in the cable hut there. 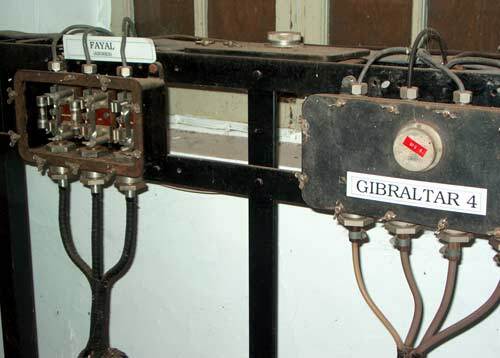 Cable terminations for the cables between Porthcurno and Fayal (Azores) are shown. 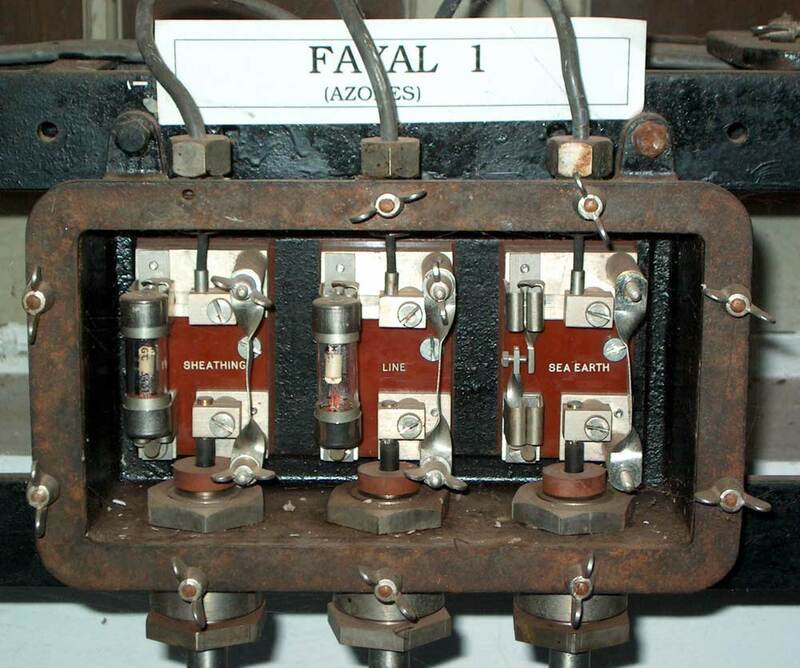 Fayal 1 (above and below) has the submarine shore end coming up into the box with three connections. This was an armoured 2 core cable with SHEATHING, LINE, and SEA EARTH connections to the land-line cable exiting at the top of the box. 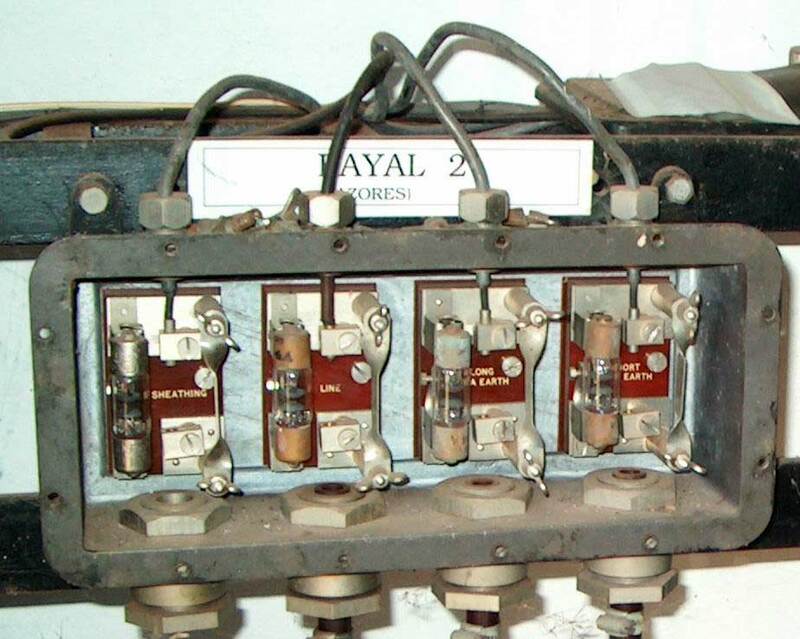 Fayal 2 (below) was a 3 core cable and had the extra sea earth. These are clearly labelled Short Sea Earth and Long Sea Earth. The author has been careful to emphasize that the signals received on submarine cables are very feeble, and that their amplitude decreases as the speed of signalling is increased. The intelligibility of received signals depends mainly upon freedom from interference. Unless the amplitude of the disturbing signal is sufficiently small compared with the amplitude of the received signal, the latter cannot be read. The speed of signalling is therefore limited by the magnitude of extraneous interference, and it is of the utmost importance to reduce interference to a minimum ; it is with this object that a sea earth, as described above, is provided on most submarine cables. Mr. J. J. Gilbert, of the Bell Telephone Laboratories, has published the results of important investigations which he has carried out in regard to disturbances experienced on submarine cables. He shows that the disturbances are due to electromotive forces induced in the cable conductor by extraneous electromagnetic fields in the seawater arising from a variety of sources which may be broadly grouped into two classes : (1) artificial sources, such as electric power, railway or tramway systems in the vicinity of the cable terminals, and (2) various manifestations in the atmosphere or at the surface of the earth, such as electric or magnetic storms. The magnitude of a disturbance falls off rapidly, as it penetrates the water, and this attenuating effect is greater the higher the frequency. At a depth of one or two miles only the extremely low frequency components of the surface disturbance are encountered to an appreciable degree, but in the vicinity of the terminals, where the water is comparatively shallow, the cable is exposed to the higher frequency components of the disturbances, and it is in these localities that the most troublesome disturbances are picked up. This is especially true in localities where the shallow water extends a considerable distance from the shore. In the majority of cases it is necessary to consider only the disturbances picked up on the portion of the cable submerged to a depth of approximately 1, 000 ft. or less, since, as already stated, only disturbances of extremely low frequencies are encountered in the deep-water portion of the cable. The action of the sea earth conductor in reducing the effects of interference is due to the fact that the sea earth conductor and themain conductor, being parallel and close together, are equally affected by the same disturbances over the length covered by the sea earth conductor. The elimination of interference, however, is not complete because the impedance to earth of the sea earth conductor is different from that of the main conductor. The portion of the disturbances picked up on the sea earth conductor and transmitted seaward is reflected at the sea end, travels back along the cable to the shore end, and causes a difference of potential across the terminals of the receiving apparatus. To remedy this condition, the sea end of the earth conductor should be earthed through a network having an impedance that bears the same relation to the impedance of the sea earth conductor as the impedance of the signalling conductor beyond the sea earth bears to the section between this point and the shore. This arrangement is known as a balanced sea earth and it is particularly adaptable to loaded submarine cables. In such cables, which are usually designed to operate at a particular speed, the characteristic impedance for all values of frequency higher than a value well below the signal frequency has a resistance component which is practically constant and a reactance component which is comparatively small. A suitable network for terminating the sea end of the earth conductor may therefore consist simply of a resistance of several hundred ohms, and a practical design for this resistance may consist of a length of several hundred feet of stranded wire, approximately 0.05 in. in diameter, of high resistivity material, and insulated with gutta-percha. After being joined at one end to the sea end of the sea-earth core, the insulated conductor is served with jute and laid up with the main core for armouring in the same manner as any other portion of the sea-earth core. The free end of the conductor is earthed by connecting it to the wires of the armouring in the usual way. The question as to how far from shore the sea earth should be located in a particular case is an economic problem, the best length of sea earth being that for which the increase in value of the cable balances the additional cost of making the extension. It is sometimes economical to obtain the desired ratio of signal to interference by means of a more efficient and expensive core rather than by an extended sea earth conductor. By increasing the weight of the main conductor, thereby increasing the amplitude of signals received over the cable, a greater amount of interference can be tolerated. For further information on the subject of the Balanced Sea Earth the reader is referred to Mr. J. J. Gilbert's article in The Electrician of 6th August, 1926. The 1902 British Pacific cable used a sea earth at the Bamfield cable station in British Columbia, Canada. The 1921 Key West - Havana telephone cable page includes information and diagrams of the single sea earth cables used on that route. The 1920 Brazil - Uruguay - Argentina telegraph cable made by Telcon for All America Cables also shows the use of a single sea earth. The 1928 Le Havre - Bay Roberts cable uses long and short sea earths.